Final-stage drama spells another victory for two-time World Champion, as young Norwegian teammate fails heroically. 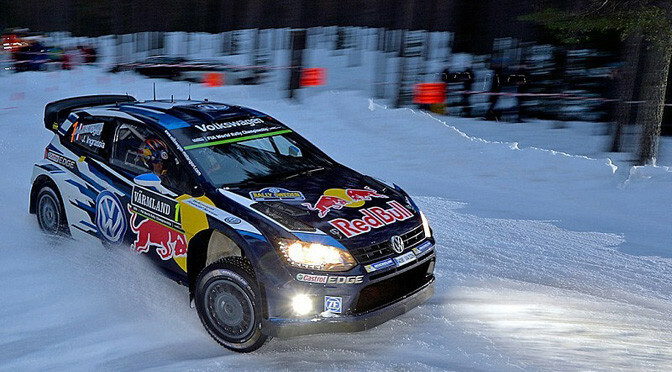 Sebastien Ogier claimed the most remarkable victory of his already-illustrious World Rally Championship career on Rally Sweden, as Volkswagen teammate Andreas Mikkelsen spun away his lead on the very last stage. Mikkelsen began the stage 3s ahead of Ogier, with just the 15.87 powerstage of Varmullsasen remaining. Mikkelsen was entering the final section of the stage when he clipped a bank on a left-hander, and almost corrected the slide before he nosed into the snow bank again, and required help from the spectators to push him back on the road. “We gave it our all,” he sighed, and finished 39.8s behind the winner in third. Ogier was told of Mikkelsen’s spin by reporters after completing the stage. Despite starting the day as the rally leader, Hyundai’s Thierry Neuville slipped back to third in the overall standings as the Volkswagens turned up the wick. An intercom problem caused a trip into a snow bank this morning, costing him time, but Mikkelsen’s spin meant he was promoted back to second. He finished 6.4s behind Ogier. M-Sport’s Ott Tanak finished fourth in his Ford Fiesta, ahead of the second Hyundai of New Zealand’s Hayden Paddon. Elfyn Evans claimed sixth in his M-Sport Ford Fiesta. Citroen’s Kris Meeke spun on a fast right-hander in the powerstage, trying to jump ahead of fellow Briton Evans, but still finished ahead of Martin Prokop. Volkswagen’s balance of power shifts to its young Norwegian as its star names shunt. Andreas Mikkelsen has taken a shock lead in Rally Sweden after his Volkswagen team-mates Sebastien Ogier and Jari-Matti Latvala both went off during the final forest rally stage of the day. Ogier spun early in SS9’s Torsby stage, losing well over 30s. He ended the stage with many of his dashboard alarms flashing, as the off had filled his car’s radiators with snow. Meantime, just a few minutes later, Latvala crashed on the exit of a right-hander just 600 metres from the end of the stage, ditching his VW Polo just as he was poised to take the lead overall. Mikkelsen inherited the lead, and was incredulous when told of the news. Thierry Neuville set the fastest time on the stage, elevating his Hyundai to second overall. “If we had the quick-shift and the better engine, we would be right in the fight,” he said. Mikkelsen leads Neuville by 19.7s, with Citroen’s Mads Ostberg now third. Ogier has dropped to fourth, 26.1s off the lead. Latvala lost 8m26s, and is now completely out of contention for victory.